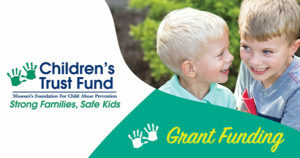 The Missouri Children’s Trust Fund (CTF) Board of Directors awards grant funds designed to support child abuse and neglect prevention efforts in Missouri. Notices of available funding for all CTF programs will be posted on this webpage. CTF anticipates awarding $200,000 of home visiting funding for State Fiscal Year 2020. This funding opportunity is intended to support eligible agencies/organizations that provide evidence-based home visiting services to families in Missouri to prevent child abuse and neglect. Invitations to submit a full application will follow the review of Letters of Intent (LOI). Those interested are strongly encouraged to read the full application before submitting an LOI. Home Visiting Grant Letter of Intent (LOI): CTF will accept Letters of Intent to apply through April 9, 2019. Home Visiting Grant Request for Application (RFA): Full applications will be solicited by invitation only and are due May 3, 2019. Discretionary Child Abuse and Neglect Prevention Grant Program – Closed, no longer accepting applications. CTF anticipates awarding $50,000 to support FY 2020 Discretionary Grant awards. Through the Discretionary Grant Program, CTF awards 1-year contracts for up to $5,000 to support child abuse and neglect prevention efforts. CTF will accept applications until available funding has been fully obligated. The Discretionary Grant application process is online. To apply for Discretionary Grant Program funding, click → here ← for the online funding application.